We're not actually reviewing a wall-mounted mirror, but something that's still gorgeous and very useable. 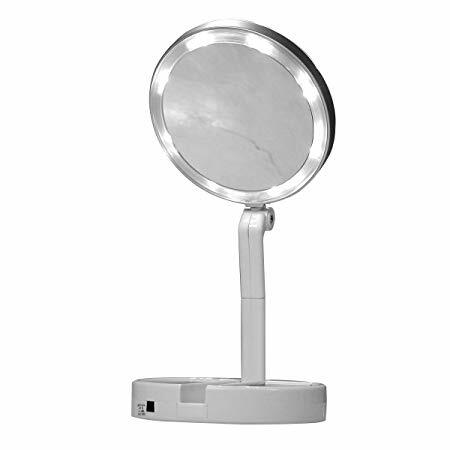 It's a compact and very transportable mirror that also really works well for putting the finishing touches to a glam night out, or doing the job of removing make-up from your evening's festivities. The Finishing Touch Flawless Folding Mirror (£19.99 from www.JMLdirect.com) is the perfect companion for makeup on-the-go! This LED mirror combines a compact, take-anywhere design and high-definition, crystal-clear illuminated mirror for that perfect flawless finish. What's more, this mirror also has an inbuilt storage tray for tweezers, wipes, makeup or jewellery, making it the perfect companion for on-the-go glam!